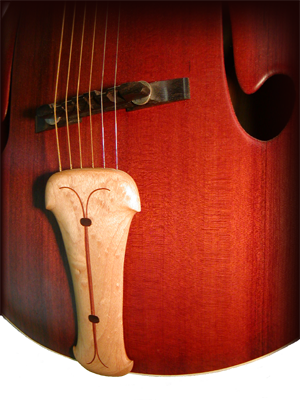 Michael McCarten is a luthier involved in creating stringed instruments of various types. He has a primary interest in archtop instruments but is also influenced by many different types of instruments and more importantly, varied music from differing cultures. He is open to incorporating these elements into his work. Instruments are hand crafted individually from select materials chosen to suit a particular instruments character. Tone woods are selected which contribute to the tonal quality of the instrument. Pride is taken in the attention to details which differentiate a hand made instrument from the mass produced guitars more commonly available. Residing in the North Quabbin region of Massachusetts, he relates to the history of the region and he values and respects the environment and materials nature provides locally as well beyond the area. Located centrally between the vibrant Boston/Worcester music scenes, and the rich variety afforded by the "five college" area of Amherst/Northampton, Michael endeavors to provide instruments to creative players, and to support their efforts by way of his abilities and services.